Along with dental sealants, dental fluoride treatment is one of the most effective ways to prevent tooth decay and maintain excellent dental health in children. Fluoride treatments are both safe and effective in decreasing the prevalence of cavities in children, by 95% specifically, when combined with dental sealants. Making the tooth more impervious to acid attacks caused by sugars and plaque bacteria in the mouth, fluoride acts as a shield for the outer enamel layer of the teeth and actually has the ability to reverse early dental decay in some cases. Ask your pediatric dentist about professional fluoride treatment for you child. Our dental topics page provides other information on oral hygiene during pediatric dentistry. Fluoride is a naturally existing mineral found in water, many foods, within the earth’s crust, and widely throughout nature. Fluoride is often added to tap water supplies for drinking and to toothpastes for children and adults. In the 1930s, researchers determined that people who had grow up drinking fluoridated drinking water had about 66% fewer cavities than people living in areas without fluoridated drinking water. Ever since, research has recurrently proven fluoridated drinking water to reduce levels of tooth decay within communities. Fluoride is beneficial for all children, because it helps shield young teeth from damaging acid and can actually rescind early signs of dental decay (reverse very small cavities). Hurtful acids in the mouth form from bacteria combined with sugars. The acid damages the hard protective outer layer of the tooth called enamel. On a daily basis, minerals are being lost and added to the enamel layer of the teeth through naturally occurring processes called demineralization and remineralization. Minerals are lost (demineralization) when acid attacks the enamel, and minerals like phosphates, calcium, and fluoride (which all strengthen the teeth) are added back (remineralization) when kids drink water or eat foods that contain these minerals. Cavities form and decay occurs when too much demineralization transpires without enough remineralization to restore enamel. According to the American Academy of Pediatric Dentistry (AAPD), professionally applied topical fluoride treatments are effective in decreasing dental decay in children as well, especially those in a high risk category for decay. Having fluoride professionally applied during a pediatric dental visit ensures your child’s teeth have received an adequate and protective amount of fluoride to successfully obstruct acidic breakdown of the enamel layer of the teeth. Only small amounts of fluoride are required for children to receive the maximal benefits. Professional dental fluoride treatments for children are applied to the teeth in a gel, foam, or varnish form. These treatments consist of highly increased levels of fluoride as compared to what is found in water and toothpastes. Ask your pediatric dentist about professional fluoride treatments, as recommendations may vary depending on a child’s particular oral and dental situation. Overall, however, these treatments are highly promoted, and parents can be assured in the difference professional fluoride treatments make in increasing dental health and strengthening the enamel layer of young teeth. 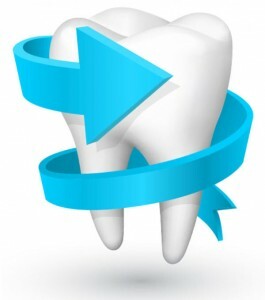 In fact, recent research indicates that dental fluoride treatments are just as beneficial in strengthening developing teeth as they are in reducing the risk of early decay. How safe is Fluoride For Children? The American Academy of Pediatric Dentistry (AAPD), American Dental Association (ADA), and Centers for Disease Control and Prevention (CDC) all claim fluoridated water to be safe for children and an effective agent in maintaining dental health. As a warning, fluoride can be dangerous in extremely high doses (toxic dose level depends on individual weight). Generally, a parent should not have to worry about toxic levels of fluoride being present in drinking water but should, however, monitor carefully their children’s use of products containing fluoride, such as toothpaste and mouthwash. Fluoridated products should be kept out of kids’ reach, especially if under six years of age. It is pretty difficult, however, to reach toxic levels of fluoride, given the small amounts typically contained in fluoridated home-based products. Also, remember to only use a pea-sized amount of toothpaste on a child’s toothbrush. When Should My Child Begin Using Fluoridated Toothpaste? 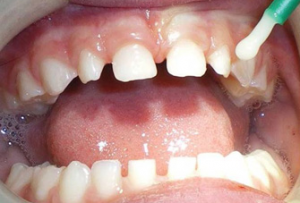 The American Academy of Pediatric Dentistry (AAPD) recommends using just a “smear” of fluoridated toothpaste beginning when the first tooth appears, until a child is three years of age. At three years old, a pea-sized amount of fluoridated toothpaste can start being used. Ask the pediatric dentist about fluoride safety and precautionary measures recommended for young children, especially those under the age of six.